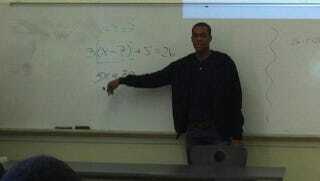 Rondo was in front of the class, explaining how he figured out the value of "X" in the equation "5X = 70." "When he saw how the students had [solved] it, he said ‘I did it differently,'" Oshodi said. Rondo then broke down his method by saying that in his head, he went back to his multiplication tables, telling himself that 5 x 12 is 60 and 5 x 2 is 10. Add 12 and 2, he said, and you get 14, the answer. He made sure to acknowledge that there are often different ways to solve a single problem. I can't think of a more perfect way for Rajon Rondo to approach a math problem. Of course the guy who plays point guard like a surly alien and is constantly inventing his own angles would solve that problem using memorized multiplication tables rather than just dividing by five. You are an awesome weirdo, Rajon Rondo.